What is Magnetic Water Treatment? Most homeowners and people who run commercial and industrial applications understand that hard water lime scale and corrosion can cause significant damage. In the home, the most common areas of damage include water heaters, ice makers, coffee makers, humidifiers, and the related plumbing system. Despite this knowledge, they may not realize the need for magnetic water treatment for scale prevention. A magnetic water conditioner treatment is the best way to control scale and remove existing scale deposits that can affect the quality of water used for showers, washing clothes, drinking, business operations, and much more. When you opt for a magnetic water conditioner treatment from Superior Water Conditioners, it begins to polarize your water immediately to remove existing scale deposits. The magnetic water treatment also prevents minerals present in the hard water from attaching to the inside of equipment, appliances, and pipes. This occurs because we use the best magnetic water conditioners to break up scale that will either pass on through the plumbing system, or drop out to a low point of the system, such as a tank type water heater, where they can be easily drained off periodically. 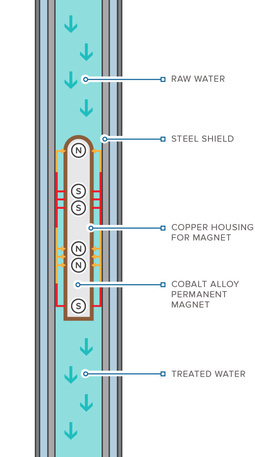 Magnetic water treatment for scale prevention first came about in the 1930s. Companies like Superior Water Conditioners have advertised and sold magnetic water treatment systems since that time. Once a home or business owner invests in the best magnetic water conditioners, they tend to be sold on the benefits for life. They have experienced the huge difference that magnetic water treatment makes and do not want to return to dealing with the effects of lime scale build up and hard water deposits. Those in the hospitality and entertainment industry appreciate magnetic water conditioners because they help to improve water quality in ice makers and other foodservice equipment, swimming pools, and hot tubs. Besides making these products more enjoyable to use, a magnetic water conditioner treatment reduces energy, maintenance, and repair costs, while increasing the longevity of major appliances and applications. Whether you purchase a magnetic water conditioner from us and install it yourself or prefer to have one of our dealers do it, this type is easier to install than some of the other types. One reason for this is that we sell only the top magnetic water conditioners. Another is that magnetic water treatment systems attach easily to any type of plumbing systems, whether they be made out of copper, galvanized pipe, PVC, PEX, etc. It is simple to install magnetic water conditioners from Superior, in POU applications on various appliances in the home such as water heaters, dishwashers, ice machines, humidifiers, etc. Why Choose Chemical-Free Magnetic Water Treatment from Superior Water Conditioners? While we understand that we are not the only company that offers magnetic water treatment systems that do not rely on chemicals, we think you will find that our company has a unique history and experience in the industry, combined with unparalleled customer service. That is because we take an entirely different approach to magnetic water treatment than others do. We pay careful attention to the flow rate of water and the diameter of pipes. This enables us to select the model of water conditioner most appropriate for your specific appliances or plumbing system. Our magnetic water conditioner treatment is extremely effective because it prevents calcium carbonate and magnesium carbonate from creating limescale deposits. If you have not had a magnetic water treatment in some time, our product will break up existing deposits. Our chemical-free treatment temporarily alters the ionic charges of minerals. Rather than bonding together with one another, which leads to scale buildup, the molecules repel one another, thus, preventing buildup. You can relax knowing that you, your family members, or employees will not ingest any additional chemicals after a magnetic water conditioner treatment since it does not contain any, and actually does not add or take anything out of the water. Therefore, water purity is maintained. At Superior Water Conditioners, we take pride in helping our customers save money as well as conserving our natural resources. You save money because our magnetic water treatment does not require any energy to operate. That means no running up your utility bill just to get your water conditioned. Additionally, no salt or other chemicals are required. 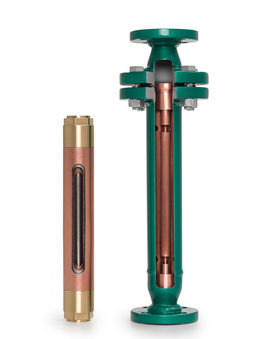 Once installed, our magnetic water conditioner requires little to no maintenance, and absolutely no replacement parts. It is only the best magnetic water conditioners that can make the claim to last for decades before requiring replacement. When you work with other water conditioning companies, you cannot be sure that the treatments do not contain harsh chemicals that can be harmful to your health and the environment. We never use chemicals of any kind in our water treatment process. Chemical usage is unnecessary because the technology we have developed prevents scale from forming. Your water receives treatment in the chamber of our product. Our treatment reduces the surface tension of water, which causes it to become wetter, or more penetrating. This process will gradually remove existing lime scale buildup from your appliances and related plumbing system in retro-fit applications. Because our water conditioner treatment contains no chemicals, it does not impact the environment in any way. With other treatments, the salt or chemicals added to the water can run off into the ground and into streams. Magnetic water conditioner treatment is equally as effective in a commercial or industrial setting. If you own a business that relies on water-using equipment, it is important to understand that mineral deposits can have a major impact on the efficiency and performance of such. The less efficient your equipment operates, the longer it takes your employees to complete tasks. And slower production can ultimately affect your business profits. Installing a commercial magnetic water conditioner is a simple and cost-effective solution to this common problem. If you have an industrial plant that operates cooling towers and/or process steam boilers, you probably already know that hard water minerals can build up on the heat transfer and evaporative surfaces of your equipment in a short period of time, thus causing inefficient operation. The benefit of working with Superior Water Conditioners is that it saves your company water, energy, and money. You also save time by not having to file a hazmat report since our magnetic water treatment uses no chemicals at all. Are you ready to experience the difference that a chemical-free water conditioner treatment can make for your home or business? Contact us today to learn more.